The subway or Metro service in Minsk comprises of only two lines while there are plans in place to add a third line to the existing network. It is the easiest means of travel in the city, more so if your desired destination has a metro station close by; don’t be deterred by the fact that your knowledge of Belarusian or Russian is seemingly non-existent! The two lines of the Minsk Metro intersect at Kovalevskaya and Oktyabrskaya stations, and criss-cross the city in the manners of an X. Thus you are able to reach almost anywhere in the city by means of this public transit system. The service remains closed during night hours. Minsk Metro has a daily ridership of 899,450 and annual ridership of 328.3 million as in 2013. At present the Minsk Metro runs for around forty kilometers in the city and serves as many as eight-hundred-thousand commuters regularly. Travel speed at around fifty kilometers per hours is relatively slow compared to most of the other Metro services around the world but it nevertheless guarantees a safe and comfortable travel. 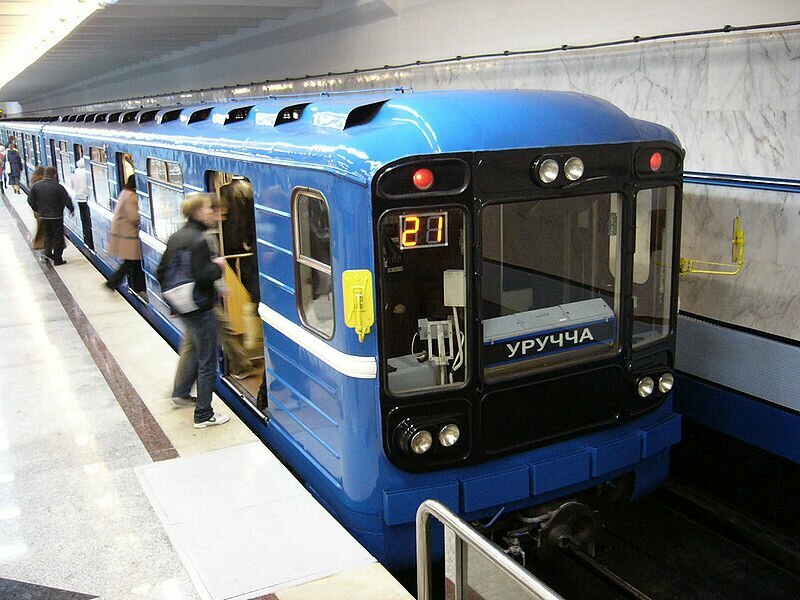 The metro in Minsk operates between 05:00-02:00 am, the next day, on all seven days of the week. The headway of the train however differs from time to time. You can get trains every 2 minutes, or it could even take you 12 minutes. It all depends on the day and time. The passengers of Minsk metro can make fare payments by purchasing tokens or contactless smart cards. A token can be purchased for a single trip while cards can be used by frequent travelers. A single token is valid for one entire trip, from the time a passenger enters the metro system till the time s/he leaves the system. It can be used for making one trip over any distance. A token can be purchased for Br5,500. The contactless radio cards or magnetic strip cards require a minimum deposit to be paid. They can be used for the time duration for which they have been loaded. A passenger can take a maximum of 4 trips on a card charged for 10 days. The card can also be charged for 15 days or half month. A card which is charged for 30 days or one month allows a maximum of 120 trips on that card during that duration. Passengers can also purchase tickets, depending on the number of trips they wish to make. Tickets can be purchased for 5, 10, 20, 30, 40, 50 or 60 trips. Transfer fares are not applicable for making transfers to other metro line. Various types of seasonal passes are also available. The tickets come in the form as a package. For example: you can purchase a ticket for either two, three or four modes of transport. The metro allows its passengers to carry things like baggage (provided it conforms to the allowed dimensions), skis, children bicycles etc. for free. The rules with regard to the allowance of animals on the metro network are pretty much the same, as elsewhere in metro systems around the world. Guide dogs for the visually are allowed subject to no terms and conditions. However, the others aren’t so lucky. Animals are allowed on the metro system provided that they are in a cage or container of some sort. While riding the trains, holding on to the handrail is always advisable. What’s really important is, to not create a congested atmosphere. Smoking and drinking inside the premises of the metro network is prohibited. So is the case with the use of any kind of narcotic substances. A friendly tip, do not depend on the fences as they are not too stable and especially do not leave young children unattended at any time. Not too popular a rule among the teenagers, but headphones are not allowed while on the platform. Listening to the announcements is stressed upon in this metro network. The metro provides a comfortable and convenient way to travel around the city, and nearly 800,000 passengers use the metro every year. This should not be a surprising fact with the quality of service provided by the Minsk metro. All the metro stations are equipped with CCTV cameras, and video cameras are also installed inside the cars. Security officers and police personnel also patrol the platforms, entrance halls. The metro stations are also equipped with blast inhibitors. Metal detectors and scanners are used for additional security and checking. Moreover, seats are reserved for pregnant women, disabled people, elderly people and women with children as well. Probably why it’s so popular! All the stations are beautifully designed and decorated. For the convenience of passengers, the metro line charts are also provided inside the cars. At all metro stations exits, signs with name of the nearby landmarks and streets are provided. The metro system operates 2 lines. One line is Maskoŭskaja Line which serves 15 stations over a track length of 18.1 km (11.2 miles), and runs between Uručča and Piatroŭščyna. The second line isAvtozavodskaya Line which consists of 14 stations and of track. It has a track length of 18.1 km (11.2 miles) and runs between Kamiennaja Horka and Mahilioŭskaja. Map of Minsk Metro showing various routes and lines. 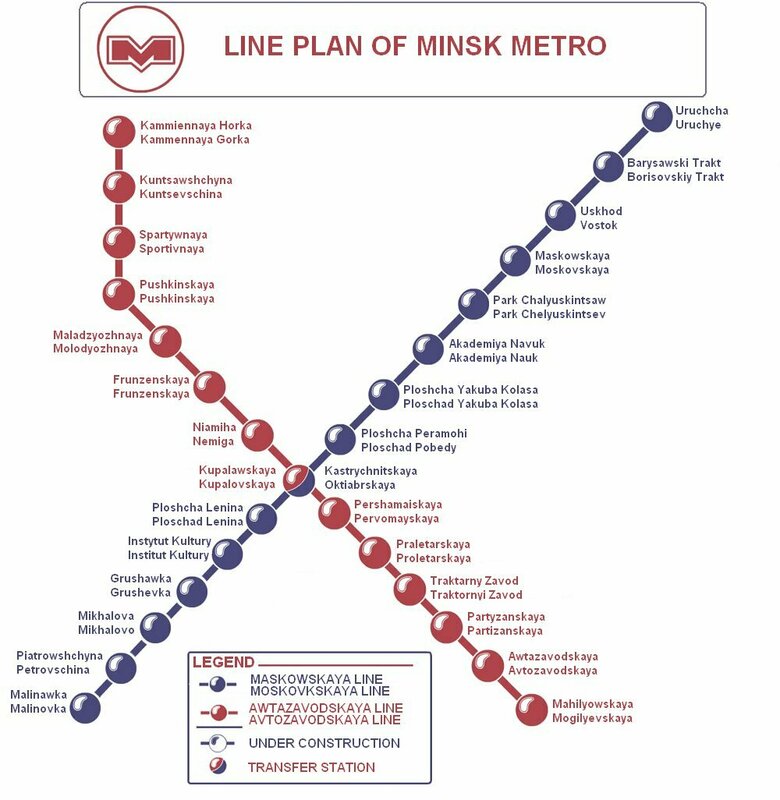 Click on the map to enlarge it or Download Minsk Metro map in PDF.